If you work in a library, chances are you’ve seen or heard calls for you to become a library legislative advocate. You may have seen e-mails asking you to fill out a web form asking legislators to continue funding LSTA, or you may have recently seen e-mails about USA PATRIOT Act reforms. But why should librarians and library workers engage in legislative advocacy efforts? While I am by no means an expert on the topic of legislative advocacy, I have been moderately involved in advocacy work at the state and national level and it seems that I have some experience to impart to the library community. Many library colleagues have told me that they think advocacy work is difficult, or that they are intimidated by getting involved. I am also commonly asked whether advocacy efforts really make a difference. 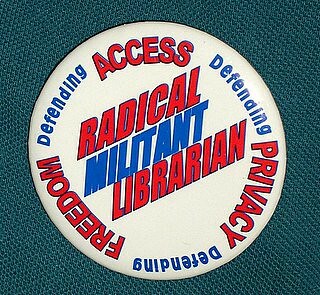 The combination of the political climate after 9/11, librarians’ bold public actions to defend privacy and intellectual freedom rights, and some thoughtful mentoring from a colleague convinced me to become a librarian. In 2002, my public library system, Multnomah County Library, filed a lawsuit against the United States of America on the basis that CIPA (Children’s Internet Protection Act) “…induces public libraries to violate their patrons’ First Amendment rights…and (2) it requires libraries to relinquish their First Amendment rights as a condition on the receipt of federal funds and is therefore impermissible under the doctrine of unconstitutional conditions” (p. 407). 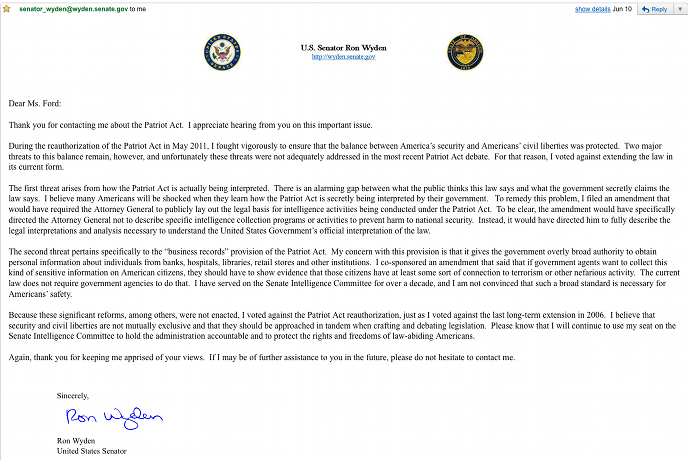 A year later an FBI agent blamed “radical militant librarians” for his/her inability to use the USA PATRIOT Act to its full potential, which was big news in 2005 when this e-mail was released to the public. Ross and Ciada (2005) describe library organizations’ reactions to the post 9/11 political climate: “To deal with the new informational and political landscapes, these organizations need both to inform their members and the community at large, as well as become more involved in the political and legislative processes that are responsible for enacting laws that could affect library services in the name of national security” (p. 108). They continue: “It is important, nevertheless, that the members of the library community in these difficult times have some sense of leadership and solidarity. In becoming active and involved, organizations such as the ALA are at the very least helping themselves to define and solidify their place and role in society” (p. 108). Today’s libraries are founded on tenets of equity, freedom of information, and defending and advocating for the public’s rights and the public good. The library workers that uphold these everyday are my heroes. Many kinds of public action articulate the value of libraries. Advocacy is defined as: “Public support for a course of action or way of doing things.” (Longman Dictionary). Due to its loose definition, library advocacy is therefore interpreted and practiced in a variety of ways. Numerous initiatives in the library world use the word advocacy to describe what they are doing and trying to accomplish. At our recently convened ALA Annual Conference, I saw a poster session by Emerging Leader groups that focused on teen services advocacy with local communities and Libraries Build Communities. Another example includes ALA President Molly Raphael’s advocacy initiative focused on empowering communities, and the list goes on. Legislative advocacy demonstrates our library/librarian values to lawmakers. This kind of advocacy usually includes communicating with elected officials via phone calls, in person visits, e-mails, and online action forms. Here I aim to outline how to do it, why you should, and discuss some personal stories that I hope will help those who haven’t yet engaged in legislative advocacy. After you read this post I hope that you will include legislative advocacy in your professional routine. The first step is to read the e-mail or announcement and see what it says. If it’s an e-mail crafted by the ALA Washington Office it usually contains a concise summary of the issue, easy to read talking points that highlight library interest in the issue, and a link. You may not feel like this is not enough information to get involved and take that action. But it is enough. If you work in libraries you already know more about libraries than legislators. Similarly, legislators will know more about legislature than you will. Next, you want to click on the link. It will take you to a web page with more information about the issue, and a space for your zip code. Read through the information given on this page, which usually provides another summary of the issue. You’ll see on that page a place for you to enter your zip code. Click on Go! and the system will automatically forward your message to your representative. 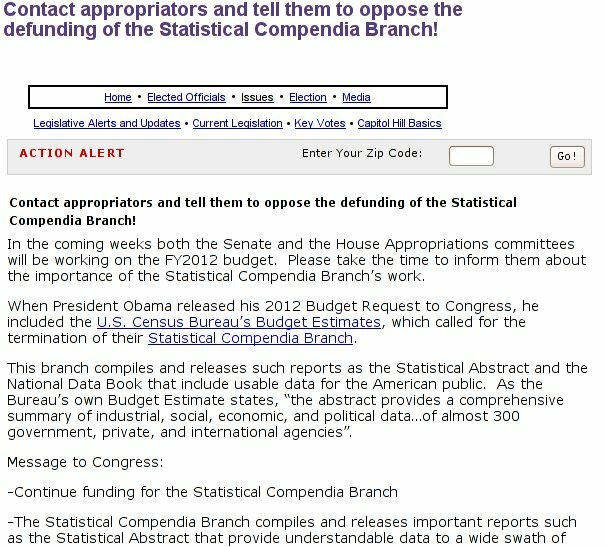 You’ll see in the screenshot below that your state representative’s name is filled in based on your zip code, as is a message about the Statistical Compendia Branch. You are free to modify the message, but you are also free to trust that the ALA Washington Office is representing library interests based on the information you read in your e-mail. Next you’ll need to fill in your name and address information and click Send. That’s all there is to it. You have just advocated for libraries. Of course there are some variations on this practice. Sometimes your action alert will ask you to call your legislators. Usually this is because action is needed in a very timely manner in Congress. E-mails take a while to filter through the system and make it to a congress person’s legislative aide. Calls are more effective on issues that are happening that day. Calls can be more intimidating if you’ve never done conducted an advocacy phone call before. But you are prepared. You have read your action alert and the web page should provide you instructions on what to say. But what if I call and they ask a question I can’t answer? Simple. Say you don’t know, offer to find out, and ask what is the best way to follow-up with a response. When you call you will talk to an intern at the reception desk of the legislator’s office. They will usually just make a tick mark on a sheet that tracks consitutents’ calls and legislative issues. You may ask to speak to the staff person in charge of education or telecommunications or whatever your issue concerns. Usually you will get their voice mail. You may also choose to call after 3 pm Pacific Time and you will usually just get the voicemail – a simple way to make that call but not have to worry about feeling intimidated. There are also other ways to participate in legislative advocacy for libraries. You can participate in organized days where you visit your local legislators or participate in National Library Legislative Day (NLLD). Organized events are a great way to get your feet wet advocating for libraries. Typically these days have briefing sessions that help prepare you for conversations with your representatives. Moreover, you can visit with a legislator or a legislative aide with more than one person. For these situations it is good for representatives to see more than one face, and having your friends beside you might ease any anxiety that you might be feeling. It is also perfectly okay for you to tell a representative or an aide that you have never made an office visit before; they will most likely understand and help you with the process. One thing that may help you feel more comfortable is that universally nobody hates libraries. During National Library Legislative Day 2011 briefings, this was stressed not only by ALA Washington Office staff, but also by panelists who have previously worked as congressional staff. To read a bit more about the information in the briefings and my office visits at this year’s NLLD, check out the blog post I wrote for the Oregon chapter of ACRL. A question I’ve heard numerous times when I’ve been asked about legislative advocacy is: How do I know that my efforts work? Is it worth my time and effort? In my experience, yes. Another recent experience was at Oregon’s Library Legislative Day at the state capitol in Salem, OR. I met with my Senator, who indicated to me that he was “happy to be meeting with a constituent.” He mentioned that he rarely meets people in his office from his district and that he had spent the past few days speaking only with lobbyists. He was glad I was there. To me this was an eye-opening experience. Representatives in our state and federal legislatures want to hear from us, but how often do they really get a chance to hear from us? This one passing comment will stick with me for the rest of my life as I work as a library legislative advocate. I know that by showing my face, using my one voice (or my e-mail), I can impact and work to improve support for libraries and legislation at the state and federal level that effect libraries. One of the issues we were discussing with Oregon legislators this year, was to retain Oregon libraries as exempt from mandatory sharing of certain public records (such as patron records). This law went under review as SB 41 (.doc), and this same legislator was on the committee that was hearing the bill! Because he was on this committee, he asked if he could contact me if he needed more information in a timely manner to make a case for libraries. Fortunately, libraries had a lot of support around the issue, and he did not need to find out more information to make a strong argument to his colleagues. This situation made me feel like I did have expertise to share with my senator, and that he was willing to listen to my perspective and what was important to me as a professional and as an individual. There are so many issue bombarding our legislative representatives, that it is really easy to miss issues that impact libraries. We can’t assume that even though our representatives might be library friendly, that they will know what is important to us. We have to tell them. More than once. A large part of being a successful advocate is being informed. Be informed about what is hot on Capitol Hill, and what is happening in your state. You are already a library expert because you work in one. But how do you keep track all of knowing when to call? who to call? There’s an app for that. The Sunlight Foundation has developed iPhone and Android apps that help you track the activity in congress. These apps let you look up representatives and clearly list that representative’s committee appointments. These apps will also let you know what public hearings are scheduled and what committee will be hearing them. Moreover, the Sunlight Foundation has numerous projects and labs that may help you with legislative advocacy work. There are also numerous other tools. The ALA Washington Office publishes the District Dispatch blog, which, with timely posts and e-mails, lets us know when the time is right. The Washington Office also recently announced a Twitter feed that will help broadcast issues as they are happening. You might also consider following web sites such ask GovTrack.us or the National Conference of State Legislatures to help you find out what is happening legislatively. In addition to information about what is happening and when, you need something else. You need a good story backed with solid evidence. When it comes to advocacy your expert library knowledge–combined with good, relevant stories– is power. For example, in Oregon we are dealing with an abysmal number of school librarians. They are quite rare. But I’m an academic librarian. What is my story when I talk to legislators about how important it is to have school librarians in K-12 education? I talk about the transliteracy skills I see in students when I teach and when I help them at the reference desk. It is always apparent to me when new university students have had a librarian in their schooling and when they haven’t. According to the School Library Data compiled by the Oregon State Library, of the over 1300 public schools in Oregon, the state only has 304 FTE school librarians. This is inadequate and it is dooming students to struggle when they reach college. Everyday I encounter students who don’t have basic library and research skills. I can talk about these basic skills, such as using an index and creating citations, and the message really hits home with legislators. If you’re running advocacy for a group, you can use Capwiz, a piece of software that makes embedding an advocacy widget easy. 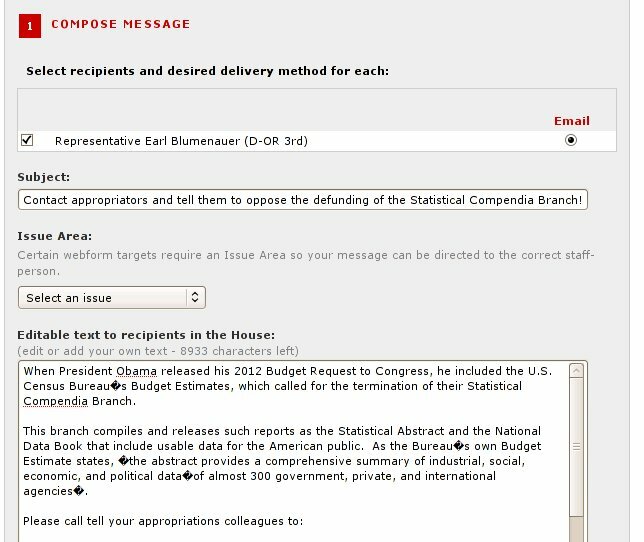 You can customize the widget with a message that you want your group to send to representatives, and it enables individuals to target their own state representatives. The Oregon Library Association’s Library Legislative and Development Committee uses this tool. Advocacy Toolkits are another source that will help you run advocacy initiatives in your community, and/or will provide information about how to be a successful legislative advocate. The Advocating in a Tough Economy Toolkit includes a section on working with legislators, and the ALA Washington Office offers free webcasts and trainings on advocacy a few times a year. First and foremost, if you advocate for libraries to be better funded, you will have better chances of keeping your job, your program, your building, your office, an increase in salary, etc. If you show the good work you can accomplish, you’ll get to do more of it. In fact, ALA Executive Director, Keith Michael Fiels, referred to the Capwiz advocacy tool as a major accomplishment for ALA. During an ALA Executive Board meeting last Friday (6/24/2011), he lauded Capwiz for being the tool that has saved libraries so much money (in that Congress hears us and keeps us funded) that we have saved 15,000 jobs. That is, library advocates using the Capwiz tool via Action Alerts, have saved 15,000 jobs. How? By using advocacy techniques the library community was able to continue funding libraries through LSTA. Congress and the public fund services that they feel are valuable. If you can work to articulate the value of libraries in a meaningful way to Congress, your city or county government officials, and your service community, you will have more support. I should also note that advocacy is an iterative process. A continual advocacy dialog is needed in order to fertilize and grow support for libraries in your community. These days we get so inundated with the day-to-day practicalities of our jobs, that we are in danger of losing the big picture. Everyday librarians and library workers create and implement programs, write book reviews, teach library instruction sessions, provide reference services and access points, etc. Engaging in advocacy is a way to step back from these practicalities and to think about the larger role that libraries play in our communities and our society. For me it is very fulfilling to know that I’m part of the bigger picture, that I’m part of the system that continues to provide equity in society, that my work contributes to the public good, and that my job and my position as a librarian is still relevant to why I entered the profession. A representative government does not and will not work without public input. As my experience at the state legislature in Oregon shows, not enough people participate. It is BIG LOUD AND VISIBLE PUBLIC ACTION that gets things done. It is what librarians like fellow Lead Piper Brett is trying to achieve by boycotting Harper Collins. It is what happened when there was a bus strike in the South during Rosa Parks’ and Marin Luther King Junior’s time. Without collective public action, without the many tens of thousands of voices our chances of being heard are small. ALA alone has over 60,000 members, and that is not every librarian or library worker out there. What could over 60,000 people accomplish for libraries if everyone participated? That is why you should do it. If you don’t, it’s like saying you don’t believe in representative democracy. So really, what can you do? 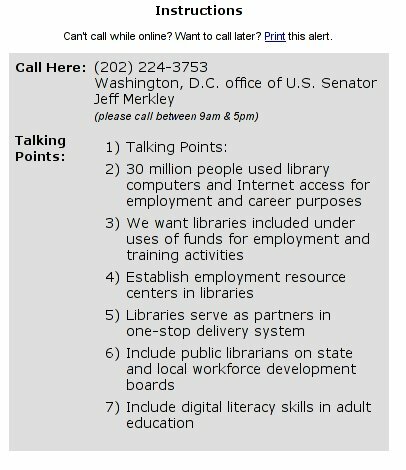 As I’ve discussed in this post, legislative advocacy for libraries by library workers is important, and doesn’t happen enough. However, there are numerous things that you can do to get involved in legislative advocacy for libraries. Start reading advocacy messages you receive via e-mail, or Facebook, or Twitter and contact your legislators. If you’re a member of state or regional organization that performs advocacy work, get involved with your local committee. See if your organization can make use of Capwiz by partnering with ALA. Download an app to your smart phone, or visit a web site that tracks legislative issues to educate yourself about what’s happening that might affect libraries. And finally, encourage all of your colleagues to join us in advocating in libraries. The more advocates we have, the more successful our libraries and profession becomes. A big thank you to Kim Leeder who sat with me to brainstorm this post during a bout of writer’s block at ALA Annual, to Hilary Davis and Leigh Anne Vrabel for contributing editorial remarks, and to Janet Webster, Oregon’s number one library advocate, for feedback on this post. Abramson, L. (2005). The Secret Court of Terror Investigations. McLane, M. (2011). Library Advocacy and the College Librarian. College & Undergraduate Libraries, 18(1), 128-131. Ross, A. & Ciada, N. (2005). Action and Reaction: Libraries in the post 9/11 environment. Library and Information Science Research, 27. 97-114. Wood, D. (2011). 2011 Emerging Leaders Develop National Libraries Build Communities Program. American Libraries ALA Student Membership Blog. What a helpful post. I’ll pass it along. Glad you liked it. If you have a story about advocacy, please share in the comments! This is a very nice piece. I am going to share it with others, including the ALA Committee on Legislation Grassroots Subcommittee.